Rwanda has began using Natural Capital Accounting (NCA) as a tool to measure and integrate natural resource wealth and assets into the country’s national development planning process. Land accounts provide indicators and trend analysis to track targets for sustainability, land allocation, service delivery, and productivity. Policy makers and practitioners can use this information to clarify and compare economic values generated by land in competing uses and how changes in land use may affect land asset value. The report provides land use and cover information that can inform land-use planning from the local to national level. Land use and cover accounts can also inform Rwanda’s efforts to build climate resilience, reduce deforestation, and increase forest cover. In Rwanda, land is the foundation for all socio-economic activities and livelihoods. But today the same land faces pressures from population growth, rapid urbanisation, and vulnerability to changes in the climate and rainfall patterns that result into weather extremes like droughts and floods. Natural Capital Accounts for land provide information about land assets, changes in land use and land cover, land availability and its productivity to help manage these challenges and support sustainable development planning. The first Natural Capital Account for Land was launched by the Minister of Environment on Monday March 6. At the launch event, Minister Vincent Biruta, spoke about the uses of the data and analysis, and on the need for cross sectoral coordination. 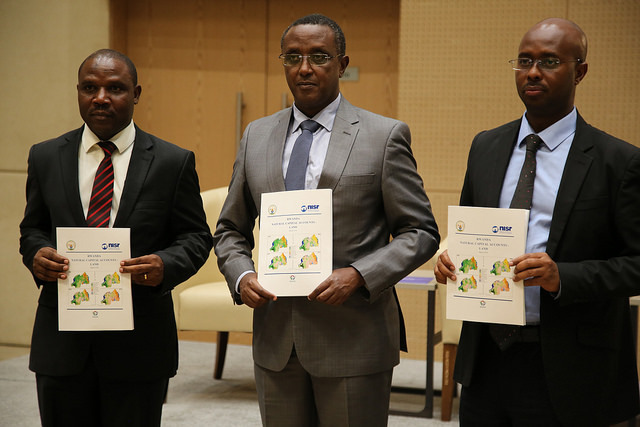 The Minister committed to continue to develop and publish natural capital accounts for land, water and minerals and to work closely with the Ministry of Finance and Economic Planning, the National Institute for Statistics Rwanda, and other agencies to utilise the information in the document. Yusuf Murangwa, the Director General of the National Institute for Statistics of Rwanda provided a statistical perspective on what has been accomplished through the NCA development process, including building capacity and platforms for the sharing and exchange of data across key sectors. He recognised NCA as an important, well-organised, consistent, nationally relevant source of data for analysis. Murangwa also agreed to provide an ongoing home for the data, so that the results can be increasingly integrated with the System of National Accounts in the future. The ministry commited to sustain the NCA enterprise so that it becomes established in a permanent institutional setting and emphasised the need to update the Natural Capital Account for land document to include 2016 and 2017 data and new analysis in the medium term, as well as the need to mobilise additional resources to sustain the NCA process. Land is the first natural resource account document to be completed and released. The development of Natural Capital Accounts for water, minerals and ecosystems (key natural resource pillars of economic development and sustainable growth) are ongoing and will be published in the near future. In 2015, satellite images of 30 x 30 resolution showed that 53.01% of the total country area is agricultural land, 5.88% of land is for livestock, 17% for forests, 3.5% wetlands, 6% water bodies, 13.11% shrub lands and 1.43% of land is for settlement.